Backpacking Background: I love Appalachian hikes and being in the woods. My preference is for a hike that leads to a stellar view. Kentucky, Tennessee and North Carolina are my usual stomping grounds. I increasingly find myself enjoying longer, multi-day hikes and I try to find a good balance between pack weight and comfort. I generally have a base weight of 12-15 lb (5.4 - 6.8 kg). All four meal varieties are also available in a Double Serving size with listed weights of 6.6 - 7 oz (187 - 198 g) and MSRP's of US $9.75 - $10.75. Made in Maine. The Good To-Go meals (generally just 'meal' or 'meals' hereafter) arrived packaged with a colorful brochure detailing the company's origins and mission and a sticker featuring the company logo. I was pleased to see that the packaging for the meals was not excessive. Each one measured roughly 5.75" by 9" (~15 x 23 cm) with a variable thickness, but no more than 1 inch (2.5 cm) thick anywhere. The pouch feels like a plastic material and has a gusseted bottom. There are notches at both sides of the top for tearing and a zip closure can be seen along the top for sealing during cooking. I like that the packaging feels rugged and does not contain excessive air. My gripe with some bag meals has been the amount of pack volume that they occupy. On more than one occasion I have had to poke a tiny hole in meals, bleed out the air to create my own "vacuum packaging", and then reseal with a dab of tape. I will not have to worry about that with these meals. 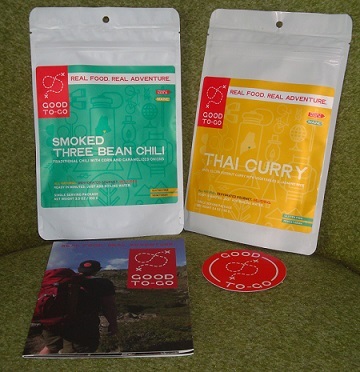 Good To-Go meals are dehydrated and packaged. The shelf life appears to be around two years. My meals have expiration dates clearly stamped on the back of the packaging indicating they are good until February 2017 (chili) and March 2017 (curry). As a bit of a design nut, I do appreciate the clean presentation. I like the bold use of color and the easy-to-read fonts. My eyes are not what they used to be, but I can read all the nutritional information, ingredients, and directions with ease. I am definitely no dietitian as the spare bike tire around my waist will attest to, but I do try and pay a bit of attention to my diet when on the trail. I have used prepackaged meals before, but have been greatly turned off by the crazy amount of sodium and preservatives that some of them contain. 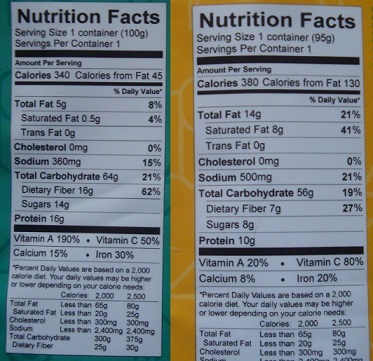 As seen in the photo of the nutritional information below these meals are fairly reasonable in sodium content and have a decent amount of protein. I was also pleasantly surprised by the Vitamin C in each one. I generally shoot for 100 to 125 calories per ounce on the trail and based on net weight my calculator tells me that the Thai Curry has 112 calories per ounce and the Smoked Chili falls just short at 97 calories per ounce. This is acceptable to me. Otherwise, I will only say that I believe I can pronounce everything on the ingredients list. The brochure touts the company commitment to "use real vegetables, freshly ground spices, extra virgin olive oil, stocks made from fresh ingredients...Real Food." I am pleased that Good To-Go has made an effort to create meals that also appeal to those with restricted diets. My vegetarian wife noticed this instantly. Per the website, the Thai Curry is pescatarian and contains a fish sauce. Otherwise, the other three are vegetarian and all four flavors are gluten free. I am anxious to try these meals. No matter how much I love the packaging and nutritional content the taste still matters. I love a hot meal after a long hike and look very forward to trying these trail meals and testing the ease of preparation, flavor, and how satisfying they are. I was really anxious to give these meals a preliminary try before packing one on an overnight trip. 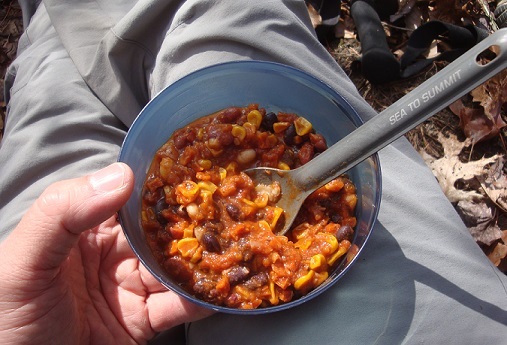 I had a nice 11 mile loop picked out and it was a simple matter to stow my stove, pot, and the Smoked Three Bean Chili in my daypack and hit the trail. I had no concerns about how satisfying the meal would be. I just wanted to test the cooking aspect. At roughly the halfway point and high on a ridge, I ducked off the trail near a rocky outcropping to avoid the wind and started my water boiling. The directions were simple enough. I tore open the package, removed the oxygen absorber and waited for one and a quarter cups (300 ml) of water to hit a boil. I added the water, stirred, and resealed the zip closure. I set my phone's timer for 20 minutes and waited. I will note that when I bag cook I generally use a reflective "cozy" to retain heat, but I purposely avoided doing this and prepared the chili exactly per Good To-Go's instructions. The outdoor temperature was mild and the day sunny. When the time expired the bag still felt reasonably warm to my fingers. The chili had a good presentation once poured into the bowl as seen below. The consistency was thick enough and the ingredients were colorful and appeared fresh. I was a bit disappointed with the aroma. I really didn't detect any real hint of either smokiness or chili powder. Unfortunately, this also carried over to the flavor. I understand that these Good To-Go meals are described in the literature and on the packaging as "dehydrated gourmet" and gourmet branding often means something unexpected. I have tried many gourmet interpretations of classic dishes and for me this is simply not chili. Spoonful after spoonful I kept waiting for something that would trigger my senses, but it did not happen. To make matters worse, the black beans did not rehydrate properly. They were crunchy throughout the entire bowl. I noticed it on the first bite and it only took me a few seconds to isolate the black beans as the source. They were edible, but it was not enjoyable. As I ate my meal I wondered if it would have cooked better with a thermal barrier around the package. My overall first impression of the Smoked Three Bean Chili was negative. Even if I were to just accept it as a hearty soup/stew, the flavor was nothing special. Also, the fact that it did not cook properly was a serious failure to me. I was surprised when only a few days later I received three additional meals in the mail. The new shipment included another Thai Curry, a Mushroom Risotto, and another Smoked Three Bean Chili. Since I was still a couple weeks out from a long overnighter I figured I would try to experiment with the chili again at home. I prepared it according to the same directions, but this time I put the package inside a reflective bubble wrap DIY pouch I use for other meals as an insulator. I also let the meal hydrate an additional 5 minutes (25 minutes total) before sampling again. The results were much more successful. This time the black beans were soft with no signs of crunch. The presentation in the bowl was eye appealing, but the taste was as before. I noticed no smokiness and no real chili flavor. If I were blindly handed a spoon with no knowledge of what it contained, I certainly would never think it was chili. Since it was convenient I doctored the meal with some hot sauce and some chili powder which helped. It was with a bit of trepidation that I stowed two packs of Thai Curry in my pack for an overnighter. My disappointment with the chili still lingered and I hoped that the Thai Curry would be a big improvement - especially since it would be my principle meal on a very long hike. Hitting the campground that evening, I was very tired and glad that the instructions on the Thai Curry package were nearly as simple as the chili. Upon ripping open the package to remove the oxygen absorber and coconut powder package I was blasted with the most wonderful aroma of the spices within. It was instantly apparent to me that this dish was going to be a substantial improvement over the chili. Even tired and with partially stuffed nasal passages from allergies, I could pick out garlic, ginger and cardamom. 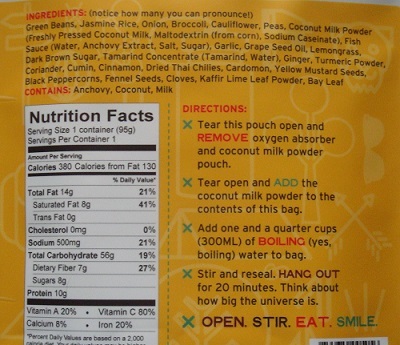 I ripped open the coconut powder package, added it to the contents of the meal bag and patiently waited for the 1.25 cups (300 ml) of water to boil. Once it hit a nice rolling boil, I poured it into the dehydrated meal, stirred it up and sealed the bag. As hungry as I felt, the 20 minute wait time seem to take forever! The minutes ticked away and my food was ready. I only had a short-handled spork with me so to make it easier to eat from the package I used my scissors to cut the bag down a bit. The very first bite was incredibly rich and full of complex flavors. Of course, the coconut milk was readily apparent, but the chunks of broccoli, cauliflower, green beans, and jasmine rice all contributed. With each bite, it seemed like I would pick up a new taste. The spicy heat began to build up as I ate. I was really enjoying this dish and I probably should have savored it a bit more, but I could hardly slow down. I knew that I had another Thai Curry package with me, but after finishing this first one I felt satisfied. This was probably due in part to my overall exhaustion, but the richness of the dish really made this feel like a meal to me. The Thai Curry really was a complete turnaround from the Smoked Three Bean Chili. This is what I was expecting Good To-Go Meals to taste like. It hydrated well, tasted great, and had quality ingredients. Best of all it actually tasted like a meal that would have taken a substantial amount of time to prepare, but without all the wait or cleanup. This was as good (actually better) as something that I would make and eat at home. I packed up my final two meals for a quick trip to nearby Virginia for a hike on one of the most picturesque sections of the AT as it winds along Mt Rogers and the Grayson Highlands. 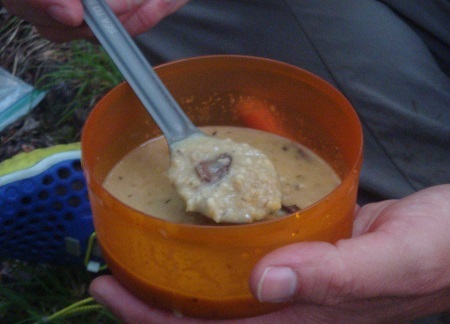 Given my recent success with the Thai Curry, I had no problems choosing it for my lunch on the first trail day just before hiking to the summit. The cooler temperatures and higher elevation did not matter and once again the Thai Curry hydrated well and tasted great. I actually think it tasted better since I was not nearly as exhausted and had more time to savor it instead of just shoveling it down. For the second day, I finally had a chance to test the Herbed Mushroom Risotto. The day was a bit warmer and our campsite was over 1000 ft (305 m) lower down the mountain. Like the Thai Curry, the Herbed Mushroom Risotto impressed me with its aroma once I ripped the pack open. I could smell the pesto and the mushrooms were easy to see even in dehydrated form. I boiled my 1.25 cups (300 ml) of water, added it to the bag, stirred and waited 20 minutes. When the time had ended, I opened up the bag and stirred again per the directions. I must say it was instantly apparent that this dish was runnier than I was expecting. I poured about half into my bowl and just felt like it was very watery. The first few bites told me that it was cooked properly, but the flavor seemed much milder than I was expecting based upon the wonderful aroma of the dry ingredients. This is a dish that I would definitely have to "doctor" with some extra spices or something if I were to eat it again. I like risotto and eat it often at home, but this meal just didn't have enough flavor for me after a day on the trail. I will add that when I got home I double checked the increments on my bowl that I used to measure my water against my proper measuring cup and it checked out the same. This convinced me that I didn't put too much water in the package. I believe it really is just this watery. 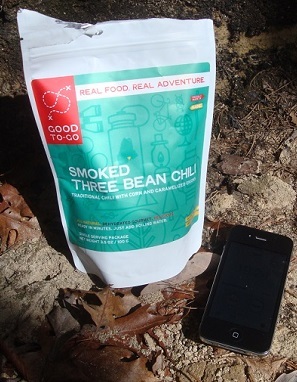 I was glad to be able to test these meals on the trail, but the results were very mixed. I could only really endorse and see myself buying the Thai Curry again in the future. It rehydrated well, tasted great, and was filling. The Smoked Three Bean Chili would probably be the next best in my opinion. It had great presentation in the bowl, but I still find it to not really taste like chili. Also, I would recommend letting it stand longer than 20 minutes and/or using a cozy to keep in the warmth while it hydrates. With some added spices it was okay and it was decently filling. The Herbed Mushroom Risotto I found to probably be the worst. The flavor was very mild and the watery consistency was a turn off. I also did not find it be very filling and definitely had to have a snack with the meal. 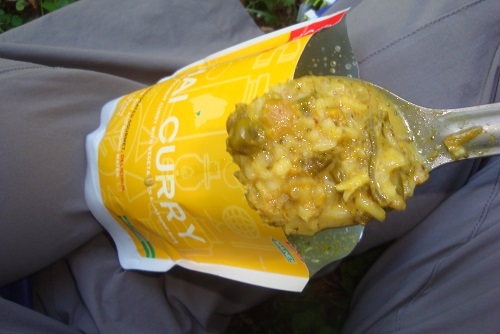 Taste is a very subjective thing and other hikers may love the flavor of all or none of these, but again, for me the only clear winner is the Thai Curry. There are positive things to be said for the Good To-Go Meals as well. The packaging is sturdy, attractive, and does not take up much volume. The ingredients are simple and natural and the nutritional values are much better than many package meals on the market today - especially the sodium. It is also nice that the company has made a concerted effort to appeal to both vegetarians and those with gluten intolerance, too. I enjoyed testing these meals and extend a sincere thanks to Good To-Go Meals and BackpackGearTest.org for granting me the opportunity.